Boron nitride (BN) is a non-oxide advanced ceramic material. Due to its interesting physical and chemical characteristics it finds intensified use in the area of technical ceramics. Among these characteristics are among other things the good thermal conductivity with at the same time high electrical resistance, the small thermal expansion and good chemical and thermal stability. A further characteristic particularly interesting for the foundry area is the bad wettability of boron nitride by metallic melts e.g. aluminum, magnesium or copper and non-metallic melts e.g. glass, basalt and cryolite . These aforementioned characteristics let it appear meaningful to use boron nitride as refractory filler in foundry coating. Therefore the Büro für angewandte Mineralogie (Tönisvorst) developed an appropriate foundry coating and examined the possibilities of the application in foundries in co-operation with the metal casting working group of the FH Aalen. Boron nitride occurs in two modifications. During the present investigations the cubic high pressure modification is ignored and only the hexagonal modification is regarded. In the literature the hexagonal boron nitride is often called " white graphite", since it has a structure which is very similar to graphite. Therefore the physical characteristics of the boron nitride are compared with those of the graphite. Some important physical characteristics are shown in the table. Both materials crystallize in a hexagonal layer lattice with a very similar layer distance. While for boron nitride a layer distance from 666.1 pm was measured, one finds 669.6 pm for graphite. Additionally both materials indicate similar densities and Mohs' hardnesses. Between the fingers they feel like talc. This is due to the plate-like formation of both materials. Therefore both graphite as well as boron nitride are suitable as solid lubricants [1, 2]. *) The different values are due to the anisotropy of the examined materials. However large differences are found to thermal stability or oxidation resistance. While graphite already oxidizes at temperatures from 500 to 600°C at air, boron nitride is stable under the same conditions to approximately 900 to 1000°C. So boron nitride can be used as a high temperature lubricant and release agent with better success than graphite . This is to be clarified by the following example (fig. 1), where the coefficients of friction of both materials are shown as a function of the temperature. To approximately 600°C graphite shows lower coefficients of friction than boron nitride. In the temperature range from 600 to 800°C boron nitride points out a more favorable coefficient of friction, which is clearly under those of the graphite. The rise of the curves with 600°C for graphite or with 900°C with boron nitride is to be due to the oxidation of the respective materials at these temperatures at air. The thermal conductivity of graphite and boron nitride is very good and is situated in same order of magnitude. However both materials differ in their electrical conductivity. While graphite can be called a good conductor, boron nitride works as good insulator. This can be explained by different linkage conditions in the structure. The non-fixed π-electrons cause the electrical conductivity of the graphite, whereas the π-electrons of the boron nitride are bound to the nitrogen and make no contribution to the electrical conductivity. By these different linkage conditions also the different colours of both materials can be explained. While the non-fixed π-electrons of the graphite are similarly as with metals responsible for the strong adsorption and the metallic gloss, the fixed π-electrons of the boron nitride are bound to nitrogen and have no possibility for the adsorption of light. • a ready-to-use coating in the form of suspended boron nitride particles in a carrier liquid should be produced. The boron nitride is to be brought into a suitable form and fine grain. • for safety reasons in melting areas of foundries water should be used as carrier liquid. Thereby the marking obligation is omitted which accompanies with the use of most organic solvents. • no oils and fats should be contained, in order to avoid the formation of pyrolysis products of such materials at increased temperatures in the formulation. • no use of preservatives, which can cause possibly dermatitic effects with the working force, what again could result in a marking obligation of such products. These specifications led to a white boron nitride coating on water base, whose application and practical testing are described next. The coating is supplied as a ready for use water-based suspension and should be diluted with distilled water if necessary. Because this coating contains no preservatives, one should use no tap water for dilution in order to prevent pollution, which could lead to a bacterial infestation. The coating is applied on either by a brush or by a spray gun. Tests showed that a dilution of 2 part cotaing with 1 part of water is sufficient. With this dilution the coating can be applied by both brush or air gun. In order to prevent chipping off during the application, the coating should be applied only in a thin layer. Twice spraying is sufficient. It must be noted that the first layer should be dry to a large extent before the second layer is applied. 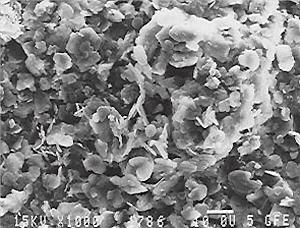 The dried coating the boron nitride coating is shown in a scanning electron micrograph (fig. 2) with a magnification of 700-times. The plate-like boron nitride particles can be clearly seen. At some grains the hexagonal formation is well visible. The spherical particle in the picture center is a remainder of the boron oxide glass, of which the boron nitride is produced by nitration. The more economical technically pure boron nitride is more than sufficient for the production of such coatings. The 2000-times magnification of the same area in fig. 3 shows the fact that the boron nitride particles do not form a close coating but are arranged in a house of cards structure. Therefore the boron nitride particles can be shifted against each other, e.g. during the thermal expansion. This is of importance for the use on substrates with relatively high thermal coefficients of expansion such as steel. Fig. 2. Scanning electron micrograph (secondary electron image) of a boron nitride coating after drying with a magnification of 700-times. Fig. 3. 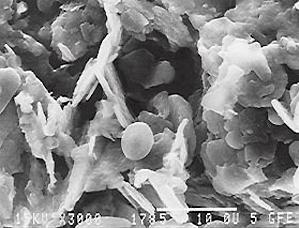 Scanning electron micrograph (secondary electron image) of a boron nitride coating after drying with a magnification of 2000-times. In the die casting an pressure die casting foundries ladles from cast irons or from cast steel are usually used. Due to the large mass these ladles extract large amounts of heat from the melt. In order to avoid this disadvantage, the metal casting working group of the FH Aalen uses cylindrical ladles made out of formed metal sheets. The sheet metal has a wall thickness of 0.8 mm. These ladles have only a small mass and to extract therefore only small amounts of heat the melt. Usually ladles in the foundry industry are protected from an attack of the melt with coatings. The more thin-walled however the ladle is, the more important is an appropriate protection by a coating. So consumption of ladles is to be reduced among other things. Still more important is however the avoidance of the iron accommodation of the aluminium melts from the ladles. The metal casting working group of the FH Aalen used ladles coated with the boron nitride coating by spraying. It was shown that the coating remains practically unwetted by the aluminium melts, which are poured in the test foundry of the metal working group. Also after numerous castings the non-wetting behaviour of the coating is preserved. This is in as much noteworthy as the non-wetting of the ladle surface prevents a skin formation in the ladle. These skins bring numerous problems with itself. They oxidize at the surface and when reconducting the ladle into the holding furnace then they are usually brought in. Gradually so the oxides in the melt are enriched. Simultaneous their accumulation in the cast parts is to be determined. Since the coating is relatively soft due to the small hardness of the boron nitride, a damage of the coating layer can occur by a mechanical effect. A damage of the coating became apparent with the attempts at the top margin of the ladles. This is caused by hitting the ladles upon outside parts of the holding furnace in order to remove possible remains of the melts from the ladle. If such a mechanical damage of the coating is avoided, can be operated here with satisfying service lives of the coating. In order to examine the behavior of coated sections in aluminium melts, both steel sheets and sheet metals from electrolytical produced copper were coated twice by spraying. They were then held in a melt of the alloy G-AlSi9Cu3 over longer time. It showed up that the coating remained unwetted to a large extent and kept its white appearance. It could be stated however that the sheet metals from copper had oxidized under the coating layer. The coating however was not damaged. From these attempts it can be concluded that - as usual with such coatings - the coating is permeable for the atomic oxygen solved in the melt. The inserted steel sheets were not attacked so that steel is well protected by a boron nitride coating from the attack by aluminium melts. The application the boron nitride coatings for ladles and moulds was intended for pouring magnesium alloys. In connection with investigations with the metal casting working group of the FH Aalen the ladles were protected for pouring the alloy AZ91 with the boron nitride coating. The results of these attempts showed that the coating was not attacked also by magnesium alloys. The life time of the ladles was similar superior to that of aluminium. Due to these results area moulds were coated in the industrial area, in which sacrificial anodes were poured. The results are pleasing, so that the application the boron nitride coating is continued here. The possibility is discussed of using boron nitride as refractory filler in foundry coatings for aluminum and magnesium alloys. In addition the physical and chemical characteristics of boron nitride are described and compared with those of graphite. Practical testing of water based boron nitride coatings showed that it can be used with good success to the coating of ladles and moulds when pouring aluminium- and magnesium alloys. Technological advantages are to be seen not only in the suppression of the formation of oxide films, but also by the reduction of the iron accommodation of the melts particularly by the ladles. Schwetz, K. A., und A. Lipp: Hexagonales Bornitrid. I. Übersicht über Darstellung, Eigenschaften und Verwendung. Ber. Dt. Keram. Ges. 56(1979)1, S. 1-4. Hofmann, U., und H. P. Boehm: Graphit als Werkstoff für die Keramik. Ber. Dt. Keram. Ges. 46(1969)4, S. 178-180. Download entire Publication as pdf (in German).